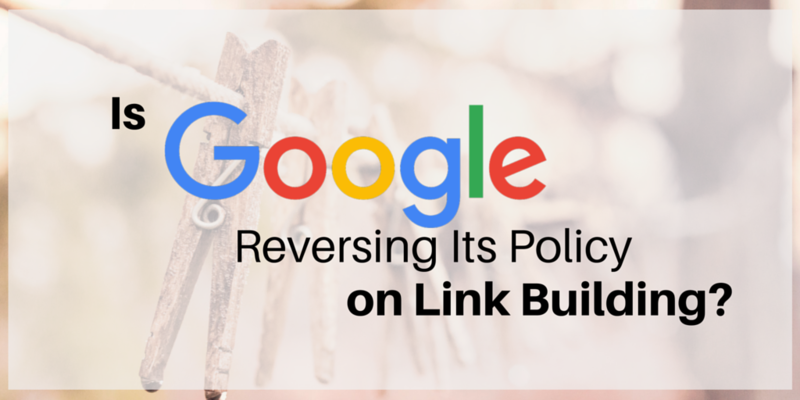 Is Google Reversing Its Policy on Link Building? Link building has been one of the most hotly debated issues in the SEO community for the past few years, and now it appears that Google itself is reversing its position on whether the strategy is acceptable as a means of increasing organic search rankings. The controversy started in the SEO community back in 2012, when the Penguin update was first released. Until that point, webmasters had built links without much forethought, getting as many links as possible without much regard for quality – it was a well-established one-to-one process. The Penguin update penalized sites that used such methods, sending the SEO community into chaos with one side arguing that link building now needed to be avoided altogether and the other side arguing that link building simply needed to be reimagined. “Modern” link building practices then began to tiptoe around Penguin, adhering to the idea that building greater numbers of more authoritative links was always a good idea, but acknowledging that certain specific link building practices should be avoided. Penguin refreshes aside, this remained the generally accepted standard of modern SEO link building, until a handful of comments from Google illuminated what was perceived to be the company’s true stance. John Mueller’s comments were the first to ignite new resentment toward the practice of link building. When asked by a user whether link building could help improve ranking, Mueller replied that it’s best to avoid any kind of link building altogether, as it is an unnatural strategy. Immediately, some search marketers scaled back or cut off their link building efforts, and SEO blogs began to flood with re-posts and opinion pieces stating that link building should now be considered a dead strategy. When pressed for comment, Google responded by updating its Portuguese webmaster blog to warn webmasters not to “buy, sell, or ask for links that may violate our linking webmaster guidelines.” You can find more guidelines straight from Google here, but the gist of this clarification is that it’s perfectly permissible to ask for links, as long as you do so in a way that does not violate Google’s golden rules of link building. Tweet this: Safe #linkbuilding = NO buying, selling, excessive exchanges, keyword stuffing or automated building. In short: no buying, no selling, no excessive exchanges, no keyword stuffing, and no automated building. To stay on the cautious side, many modern search marketers are straying away from link building as John Mueller originally suggested. Google has come out with many different statements, some of them conflicting, but everyone recognizes that one bad link could earn you a sharp ranking penalty. Tweet this: Websites will see little to no Google visibility unless there are strong external links present. The “better safe than sorry” approach would therefore be to spend more effort on alternative ranking strategies, like onsite content publication (in the hopes of attracting natural inbound links on the merits of the quality of the content) and regular social media management (to amplify the reach of the content and cultivate a community). However, a recent Moz study seems to suggest that while it is possible to rank for non-competitive phrases without links, the vast majority of websites will see little to no Google visibility unless there are strong external links present. Further, it reveals a direct correlation between the number and quality of links and the eventual ranking of the site in question across the board. This seems to reinforce what you may have already intuitively guessed; even though Google likes to downplay the importance of link building, it’s a vital strategy if you want any hope of competing for top ranks. That being said, I’d like to illuminate a possible confusion of terms. When I say link building (and when most search marketers use the phrase), I refer to any tactic or strategy whose goal is to gain one or more external links. It doesn’t necessarily imply that I build the link myself. For example, if I produce a piece of great, original content and syndicate it with the hopes that others will share it and link back to me, I could consider that a part of my link building strategy; And that scenario is perfectly permissible under Google’s guidelines. Tweet this: Depending on how you define it, link building can be a safe mainstay for modern SEO. Others may define link building in stricter terms, such as the direct course of posting a link on an external site, like in the comment section of a blog post. In this context, link building is a risky, unnecessary strategy. However, in the larger, more general context, link building is a safe mainstay for modern SEO, so long as it’s done correctly. If you’re concerned about getting penalized, your best bet is to pursue peripheral link building strategies, like moderate guest posting and the creation and circulation of potentially viral content. If you ignore broader link building altogether, you’ll never gain any serious SEO momentum. If you diversify your strategy, avoid direct infractions (like buying or selling links) and generally try to add value to the online community, there’s nothing you need to worry about. Tweet this: It’s not worth your time to nitpick the exact wording of Google employees’ comments. And as an added note, it’s not worth your time to nitpick the exact wording of Google employees’ comments—at the end of the day, they just want to make the Internet a better place, and if you do your part, they’re going to reward you. Perhaps the best word of advice in link building is Google’s own company motto: don’t be evil. Author Jayson DeMersPosted on September 9, 2015 January 8, 2019 9 Comments on Is Google Reversing Its Policy on Link Building? Link building is just a phrase which has evolved into online PR with SEO results in mind, and not the simple link begging, article submission and directory spam for 4+ years ago. The sooner people realise that, the better IMO. It’s perfectly possible to “build links” in an organic and non-manipulative way that doesn’t make the web a crappy place. Good work Jayson, (and so nearly a great name too). I think that you’d like the ridiculous acronym I decided upon a while ago – WWIDITSEDE? – as it fits quite well with the article. I think that asking for links falls into the safe side of that acronym. Hell, it’s exactly what online marketing was about before specific search engines and it’s part of the reason that links worked as a metric in the early days. Thanks for another post about what is and isn’t good link “building”. However, I don’t read a lot of posts that consider the SERP context regarding a domain’s external links. Some SERPs, for example a family law firm in a major metro, benefits more from link prevention then production where competitors employ xrumor or other seedy tactics aimed at soiling the reputation of said domain (i.e. negative SEO) whereas another family law firm may only need a link from the local village business chamber and a few applicable directories to merit visibility. It’s basic logic really isn’t it? Google want the most popular sites ranking the highest and they’ll acheive that wihtout doing much at all. http://BBC.co.uk for example but sites like http://matchdaymemories.com would find it almost impossible to get natural links back other then from social media. They need to work harder to product content and work the SEO on page rather then off. Buying links has always worked, and it always will. It’s virtually impossible for Google to detect & defend when it’s done right. The problem is that most site owners don’t have the correct foundation links in place before they engage in this practice and the majority of times their actual on-site Seo is also very poor. These days it’s possible to rank with very few links as long as your on-site optimisation is perfect, you have a nice spread of foundation links, and you market yourself as a brand online. But that’s a lot of hard work compared to just buying a few links, which is why people do it. Public scare tactics against buying links are still the best line of defence against this strategy that continues to work as it always has done. Nice article and pretty much spot on. But it is not as easy as ‘make good content and they will come’. Have you seen the most recent MOZ article around theirs and Buzsumo’s research on likes and shares of different kinds of content? A really interesting piece that shows that the majority of content that is created and ‘shared’ does not get much engagement in social, and more importantly, even less with regards to generating links. I am on the site of earning links with good content, but what good content is changes depending upon the audience that you are targeting, which many SEOs do not bother to think about before writing/creating the content. Thanks for this insightful article! At the end of the day, regardless of Linkbuilding or no Linkbuilding Google will reward sites that offer a genuine and effective experience to the users. We are all thinking of ranking number 1 in the SERP’s but do we ask ourselves what is the added value we give to even a single user ? SEO will become less and less important as new web marketing channels are emmerging big time. In my opinion, social media will be the biggest game changer as the user base grows in a way never seen before and the trend will continue no doubt about it !